Ever wonder which berry is prominently displayed on the famous Knott’s Berry Farm sign? It’s a boysenberry. This purple-red fruit is a cross between a blackberry and raspberry and was first developed by a farmer named Rudolph Boysen in 1932. When reports of his strange, new berry reached the USDA, Walter Knott, a famous berry expert, was hired to further investigate and a few years later, in 1935, he began cultivating the fruit commercially, selling them whole and as preserves. Boysenberries are juicy and sweet, like a blackberry, but can have a tart aftertaste, especially when not fully ripe. They require full sun and shelter from the wind and, like other trailing vine fruits, they require regular pruning. When selecting boysenberries, look for ones that are plump. 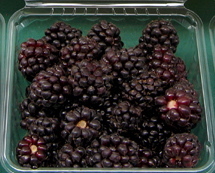 Boysenberries don’t keep long, but should be stored in the refrigerator in a shallow, covered container. Do not wash them until just before eating, as the moisture can hasten spoilage.